Rev. Kevin M. Peterson, Servant Leader and Pastor of The Second Baptist Church of Pedricktown, New Jersey. 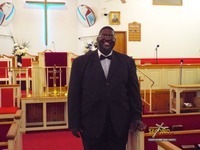 Accepted the Call to Pastor this branch of Zion on July 10, 2014, Pastor Peterson previously served as an Associate Minister at the Second Baptist Church of Atlantic City, New Jersey under the Pastorate of Pastor Collins A. Days, Sr. Pastor Peterson was licensed to preach the Gospel by his father in the Ministry, Pastor John H. Martin Jr. of the Mount Pleasant Baptist Church of Pleasantville, New Jersey on December 21, 1997. He was set apart and Ordained as a Baptist Minister in 2007 by the Second Baptist Church Ordaining Council. Born to Henry and Vivian Peterson in 1966, Pastor Peterson is the youngest of eight children, and has a heart for ministering to the people of God and encouraging men to fulfill their purpose and destiny that God has ordained for their lives. Pastor Peterson testifies as Paul did to the Church at Corinth, “But by the Grace of God, I am what I am: and His Grace which was bestowed upon me was not in vain.” 1 Corinthians 15:10a. Pastor Peterson retired in 2013 from the Pleasantville Police Department after 25 ½ years of service as a Patrol Captain. He is married to the Love of his life and best friend Stephanie and the stepfather of one daughter, De’Vona. Pastor Peterson earned an Associate in Arts degree in Criminal Justice from Atlantic Community College, a Bachelor of Science degree in Criminal Justice from Aspen University, a Bachelor of Theology degree from Andersonville Theological Seminary and received his Masters of Arts Degree in Human Services, Executive Leadership from Liberty University of Lynchburg, Virginia. Pastor Peterson is a member of The Omega Psi Phi Fratenity, Inc. and Past Asst. Grand Chaplin for the MWPHGL of New Jersey. Pastor Peterson has had the privilege to minister across several states in the U. S. and abroad including the countries of Malawi and Kenya in Africa, India and the Island of Trinidad, attempting to be obedient to the Great Commission of “Go Ye Therefore”. Pastor Peterson believes that God does not want our ability just our availability and He will give us the ability to do all that He has called us to do for His Kingdom. On August 10, 2014 Pastor Peterson was officially installed as the Eighth Pastor of The Second Baptist Church of Pedricktown, New Jersey. To God Be The Glory For The Great Things He Has Done!! !